Well... finally there is a real use for Tensor Flow APIs on new smartphones. Today, a news would be researcher in imaging who does not use "AI". The MRI scans are an example where AI should not apply. First, MRI has incredible resolution but it takes too long. Anyway, assuming that we somehow managed to get such a terribly noisy scan, AI would create a very nice image like the one shown there. The problem is - we want to see pathological formations, not a nice image. I can see a lot of suspicious objects in the noisy image which might be cancer but they are well cleaned up in the AI image. Now, one can train with scans with cancer. Then the AI may start seeing cancer where there is none (false positive). Imaging research w/o AI exists. Pattern recognition research w/o AI doesn‘t exist anymore. In your example, what research is aiming at is „super human“ performance. It has been demonstrated in a number of cases already. Yes, the AI would be trained with normal and pathological examples. Given the same number of examples, a human would (as of today) always outperform the AI. But possibly, the AI can be trained with so many examples that humans can‘t compete anymore. Because humans, or groups of humans, make errors too. Then you could actually measure the threshold where noise starts to deteriorate results. And maybe shorten MRI capture times, reduce radiological impact etc. Took it off my lips. I would MUCH rather look at the MRI noisy versus denoised. I can see structures, possible pathologies that changed shape right there in the promo image. @falconeyes - is your sense of humor amputated? I took a picture of a Georges Seurat painting and ran it through this thing. It removed all the "grain." I'm impressed! Where did you access the program? I would like to try some hands on. I'm pretty sure he's joking. But maybe not? Why not just show the doctor both versions and train them appropriately? test it thoroughly... great idea. you should really be a clinical scientistyou seem to have a knack for this sort of stuff. In this case, I would do several studies comparing MRI sequences acquired in the traditional fashion and compare them to the quick acquisition sequences performed with lots of noise and then processed trough AI. The main reason for noise suppresion application in MRI and CT is to optimise the time needed to form usable images. It can be tremendously shortened. That could amplify the type of exams and the amount of diseases that could be diagnosed with these methods. I started astro Imaging in 2011, and one of the techniques used there is to take lots of images of the same subject, plus multiple sets of calibration images and then you use all the images to clean up the poor quality light frames, then stack them together to build up the signal, then process further to generally bring out the image. It gave me a similar sense that in programs like ‘24’when they enhance an image, that it is actually feasible, whereas before, I thought it was mostly made up! You think magnifying a pixel to a full portrait is silly. I think breaking a 2048 bit key asymetric encryption is silly. The ultimate in noise free camera. 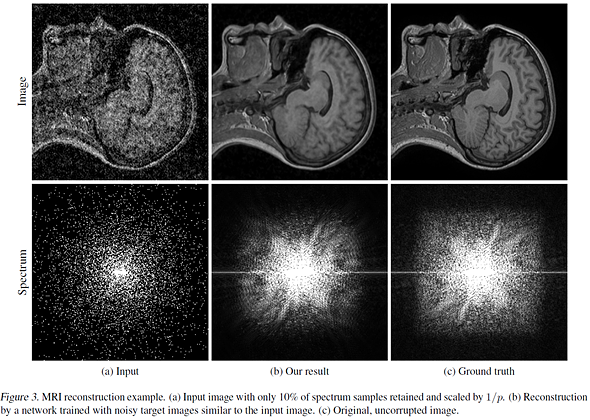 Noise reduction in images containing statistical noise is nothing new. Based on a combination Bayes theorem in statistics and the maximum entropy principle (Shannon) algorithms have been developed in the 80s. These can be efficiently implemented using GPUs. I do not see AI here. AI and machine learning appear as big buzz words which does not make anything better. Some of these novel approaches reinvent the wheel, since there is only a fixed amount of information in the image. Whether AI or MaxEnt, they are only algorithms to generate the most likely original image that is underlying the noisy shoot. "they are only algorithms to generate the most likely original image that is underlying the noisy shoot"
True, with the difference being, that these new algorithms can recognize what's "in the image" and therefore do far better estimations on "how it should look"
Do you get frustrated when other people are making cool things? Noise means: There is (real) image data lost. Any restauration (even with AI) is about to estimate the missing data. In my photography, I love to deal with real data rather than with etimated ones. In fact when you open the full res pictures these results aren't very impressive. They certainly do not come near recovering the detail in the true image. Which again is expected because noise is absence of information, information that physically can't be recovered, only guessed at. All true, but what if you are at the limit of what is possible with current tech, or even physically possible?
" information that physically can't be recovered, only guessed at." That's exactly where AI can do a better job (than averaging or filtering) : guessing. In Photography you are always dealing with estimated data. In all examples shown the estimation is closer to reality than the capture. You need to accept the sorcery. "In my photography, I love to deal with real data rather than with etimated ones." Then digital photography is not for you. Your choice of cameras that don't require "estimation" to create final image is limited to two monochrome models (one very expensive and one extremely expensive) and Merrill (or earlier) generation of Sigmas. > In Photography you are always dealing with estimated data. What the hell makes you believe such strange things? > with current tech, or even physically possible? I understand what you mean. But sometimes the best idea may be simply not taking a picture. > Then digital photography is not for you. "I understand what you mean. But sometimes the best idea may be simply not taking a picture." That is one standpoint you can take. But I don't think we all share that. Also, the process is not black and white. So what is with an image you took and you like, but it is noisy enough that it distracts from the story/memory. Why not use some of those techniques to "rescue" it, or remove just enough noise that the image works again. With good algorithms such "minor" improvements of 1-2 stops shouldn't give you any weird artifacts. This has been done for years with color noise, since color noise is extremly distracting even more than luminance noise. So the standard process is to convert it into luminance noise, by desaturating the high frequency layer. This is a standard part of denoising and does alter the image, but I don't think anyone argues that this kind of NR shouldn't be used. Indeed, my remark was a bit pointed. So if you cannot deal with your photos being a result of guesstimation, there really is not much in digital that meets your high standard of capturing "real data". It rather just shows that you don't fully understand how digital cameras work. If you don't understand that demosaicing of the raw image involves interpolation (which is basically "guessing" based on limited data from surrounding pixels), then you don't understand how digital cameras work. Only monochrome and some Foveon sensors don't require demosaicing. There are also some high res modes (eg. Olympus, Pentax) that capture full colour information for every photo site by using sensor shift. This is absolutely not relevant in our discussion. > That's exactly where AI can do a better job (than averaging or filtering) : guessing. I don't think that "subtlety" escaped anyone. But that's not the point of this chain of comments. Rather it's the truism that however advanced these replacement algorithms are, they will never equal having the actual information. That has nothing to do with the discussion here. Or have you ever seen a raw converter 'reconstructing a Koala out from almost nothing' instead of doing a (comparatively) simple color interpolation from Bayer pattern? It was you who said "In my photography, I love to deal with real data rather than with etimated ones." I just pointed out that you deal with estimated data all the time. I agree that Bayer interpolation is more straightforward, but that's a difference of degrees. You still aren't getting 100% real data. > I just pointed out that you deal with estimated data all the time. And it was me who said that has zero relevance here. It's the same if you would claim that analog photography is digital in reality, because there is 0 or 1, but no .5 photon. It is true, but has no relevance in RL. "Rather it's the truism that however advanced these replacement algorithms are, they will never equal having the actual information." I believe that you should stop splitting hairs now. You told us that you know about color interpolation during RAW development process. Fine. Unfortunately it has nothing to do with the topic of this article/thread. "And it was me who said that has zero relevance here." It did have relevance to the way I was reading your post. But you have since explained that you were making a different point than some of us believed. "It's the same if you would claim that analog photography is digital in reality, because there is 0 or 1, but no .5 photon. It is true, but has no relevance in RL." No, it's not the same at all. Demosaicing has relevance in real life, as it creates a result that is subtly, but visibly different from capturing full colour data at each pixel. It creates artifacts, simple as that. It may not impact our images in a way we care about, and may have nothing to do with what you wanted to say, but it still means that we aren't dealing with 100% real data. And this limitation isn't inherent in digital photography, as there are ways to capture light digitally that would give us more real data. It's really just a matter of time until large sensors get largely obsoleted by AI algos and computational photography. Hopefully camera makers see the potential here to improve their cameras, as opposed to pretending that those developments do not affect them. There is no reason AI could not be applied to create beautiful bokeh for example. Researches have already shown an AI that has spacial awareness so good that it can "imagine" how the scene would look like from a different angle, or even deduce what should be in places that are not part of input data. It's quite impressive. No reason those could not be used for AF, object recognition and tracking, and probably a few other areas I can't think of top of my head. I have sworn off buying another expensive standalone camera until they begin to catch the heck up with flagship mobiles in regards to image processing. Whether man or machine, eventually digital technology will make your job go away. Improving the already good will always be better than improving the bad. The best will be the combination of large-sensor, high sensitivity, good optics, high-resolution and Intelligent Image Processing. I wasn't exactly thinking of 1/2.3" sensors dethroning small and medium formats. But combine capabilities of even current 1", 4/3 and APS-C cameras with that kind of powerful image processing and you could achieve new heights in terms of what is possible. Without the necessity for very costly FF setups. Take Panasonic and their DFD technology. With that, the camera basically knows the depth of objects on the scene. Feed that to an AI algo to intelligently create a realistic looking bokeh and suddenly it doesn't matter that Panasonic cameras have 4/3 sensor and that you're using an affordable f/1.7 prime. You portraits will look like taken with an FF cam with f/1.4 prime. Or an f/0.5 prime. It can be anything, since it's gonna be artificial. Obviously this can be applied to anything. The thing is, tricks like that mean that a cheaper and smaller camera with a smaller sensor and slower lens could effectively give you images that look as if captured by something much more expensive. I guess in the end, cramming few lenses and larger sensors in smartphones could also get results like from dedicated cameras. The only physically large cameras in the future will be film? That's like saying the only physical medium for audio will be vinyl. Well, it's not that far from being off. I go to the stores here and the vinyl stands get larger and larger every year. And we're talking major mass retail store chains here, not some dedicated music record stores. It was totally unthinkable just 10 years ago. Streaming services and itunes of the world greatly reduced the appeal of a CD. I can imagine a scenario where CDs share the same fate vinyl faced 20-30 years ago. Seriously, I think it's a good analogy: analogue audio has plenty of downsides compared to digital audio, but at least it has a few unique features and a certain appeal. I think digital imaging will go the same way, clumsy "full frame" digital cameras will become the SACD of the future, superceded by small sensor cameras coupled to great algorithms. Film cameras will probably survive in a niche. Now for a Tesla board for our desktops supported by Lightroom. I'm ready to upgrade from a Quadro K1200. So, as I understand it, this sort of work is being done to make real-time ray tracing more feasible. Of course, the application to noisy images is also clear (heh), but I'd actually really like to see the results of the network on a not-so noisy image to see how much it changes ground truth from where is originally. That is: Does the denoiser eliminate detail, misidentifying it as noise? This looks like Adobe's fake focus correction a few years ago that only worked on photos they intentionally scrambled. Koalapocalypse? What is the deal with the koalas all of a sudden? Both this story and the NIKON P9000 article have them. One of them is a drop bear. Don't get the two confused. In the video it also removes any text you put over your images - such as copyright text or credit info. Thanks for making piracy of my images even easier. Don't put high res pictures online, problem solved. ..or you could just insert your text AFTER the photo has been de-noised. Whoa! 1:02 Copyright logos be damned. Damn!